Organic dairy farmer Mike Philbrick of Knox. Dairy farmers continue to face financial stress as prices paid to them continues to fall well below their cost of production. Following the suicide of a member farmer in January 2018, some Northeast dairy farmers received a list of mental health services and a suicide prevention hotline from their dairy cooperative, along with their milk checks. 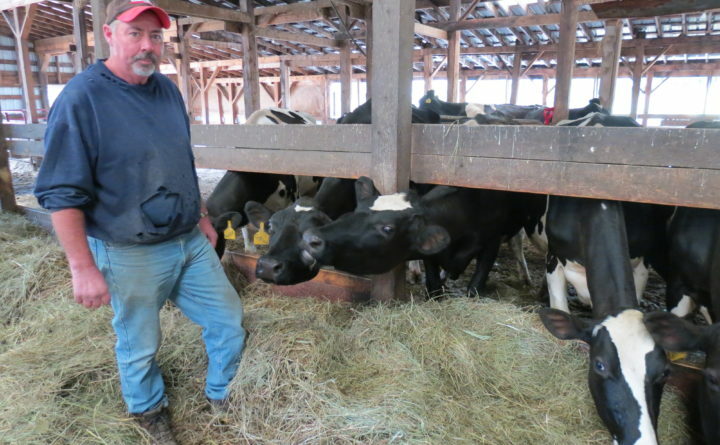 Hard times are nothing new for Maine dairy farmers, who have long been contending with problems like rising costs and falling prices for their milk, according to organic dairy farmer Mike Philbrick of Springer Farm in Knox. Sometimes those hard times can escalate until a farmer doesn’t know where to turn for help. Then things can get dark, said Philbrick, who remembered the tragic story of a New York State dairy farmer who eight years ago picked up a rifle and shot to death all 51 of his milking cows before turning the gun on himself. Given that dismal dairy landscape, Philbrick wasn’t all that surprised to learn that the Agri-Mark dairy cooperative, which serves 1,000 member farmers in New England and New York state, included mental health resources and the number for a suicide prevention hotline in a letter that was tucked in with the February milk checks. The dairy cooperative, which saw the suicide of a member farmer in January and one the year before, is in the process of implementing a free, comprehensive member assistance program. The challenging financial reality for dairy farmers has been going on for years. In fact, some dairy experts have said that no matter how hard farmers work, it seems they can’t get ahead. The Associated Press reported that farmers are facing their fourth year of milk payments that are well below the cost of production, due in part to a national and global milk glut. Prices paid to farmers hit an average of $24 per hundred pounds of milk in 2014, the highest price since at least 2000. But prices dropped to an average of $17 per hundred pounds of milk in 2015, $16 in 2016 and $17 last year. Amanda Beal, president of Belfast-based nonprofit organization Maine Farmland Trust, grew up on a Maine dairy farm and believes strongly that dairy farmers are resilient. The federal milk pricing system is convoluted, Kersbergen and Philbrick agree, and is not obviously connected to the cost of milk production. It’s based on supply and demand and also on the butter and cheese inventory, but not the cost of production, according to Kersbergen, who called it “the most complicated thing in the world.” It’s hard for most people, even many farmers, to understand. Maine dairy farmers in some ways are better situated than farmers in other states because of the Maine Dairy Relief Program (commonly known as the Maine tier program), which provides economic relief to farmers when milk prices dip below the cost of production. 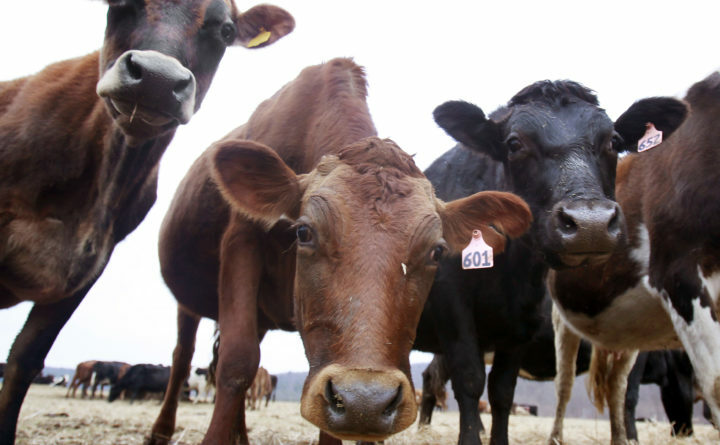 “It’s actually been a real lifesaver to Maine dairy farmers,” Kersbergen said. Still, there’s much more policy work that needs to be done to support Maine dairy farms and farmers and make sure the industry can survive into the future, Beal said. In 1950, there were nearly 5,000 dairy farms in the state, according to the Maine Milk Commission. In 2013 there were about 300, and today there are just 241. Despite the massive decline in dairy farms, the amount of milk produced in Maine has stable over the years, thanks to larger, more efficient farms, Kersbergen said. Yet dairy is a challenging industry here as well as in the rest of the country, and what Beal termed the “constant roller coaster” ride of milk pricing is one reason why small dairy farms have a hard time remaining viable. That’s troubling, she said. Another member of a Maine dairy family and outspoken dairy advocate, Jenni Tilton-Flood of Flood Brothers Farm in Clinton, said that when she saw the letter from Agri-Mark, she took it as a big step forward. Dairy farmers aren’t only contending with money troubles. They also work in rural areas and can struggle with isolation, physical health challenges, access to mental health resources and stigma about using those resources if they are available. And they’re not the only ones that are doing so. A 2016 report from the U.S. Centers for Disease Control and Prevention found that suicide rates nationwide were highest among farmers, fishermen and foresters. In the letter, she said the Agri-Mark farmer board of directors “shined a light on a very dark place.” Tilton-Flood hopes the letter will fall into the hands of those who need to read it most, including those struggling with mental and other health challenges and those who are watching the struggle without knowing how to help. Agri-Mark included the number for the Maine Crisis Hotline, 1-888-568-1112, and the National Suicide Prevention Lifeline, 1-800-273-TALK (8255).